Which major PDA is best suited for playing games, Pocket PC or Palm? Both platforms have their own pros and cons along with a large number of quality games. With that in mind, let�s break each down into three major areas: hardware, usability, and software. Palm devices simply cannot compete with Pocket PCs in terms of processor speed, memory, graphics, and sound. This fact should not come as a surprise considering that PC giants like Compaq, HP, and Microsoft lead the Pocket PC camp while Palm and Handspring, who are solely dedicated to the personal organizer market, head the Palm camp. That said, the Pocket PC (currently running at 206mhz) can already outperform desktop PCs. In contrast, a typical Palm (still running at less than 100mhz) is far behind. The Pocket PC�s processing power means more sophisticated programming. A car racing game, for example, can have better artificial intelligence (AI), better controls, and more accurate physics. A Pocket PC also has more storage. For example, lets compare two of the best PDAs for playing games: a Compaq iPAQ and a Handspring Visor Prism. The Prism can only store 8 MBs of data while the Compaq iPAQ 3765 Pocket PC can store up to 64 MBs. This additional storage capacity allows the graphics to be more detailed, sound and music to be more sophisticated, and game play to be more developed. In our example of a car racing game, a developer could create such nuances as skid marks on the track, a rearview mirror, and dynamically updated racing statistics (position, number of laps remaining, amount of fuel left, etc.). The difference in graphics and screen resolution between the two PDAs is also staggering. While most Pocket PCs sport a resolution of 240x320 pixels (the tiny dots which make up the display) at 16 -bit color, Palm OS devices have a resolution of 160x160, and most have monochrome displays. If you�ve ever played a game on a black and white TV and then on a color TV, the gaming experience seemed to be raised a notch on that color TV. The resolution helps, too. On a Palm, the resolution is so low that you can actually see the individual pixels (the tiny dots that make up the display). Pocket PC developers, on the other hand, can create graphics that not only benefit from the higher resolution, but can also take advantage of shading and various other effects. The result is that games on the Pocket PC have a much more �3D� effect than their Palm counterparts. Incidentally, ATI and Nvidia, makers of the 3D chipsets used in many desktop PC graphics cards, are both working to bring 3D acceleration to your Pocket PC! Zap is a vertical space shooter for Palm. Note how the colors don�t quite mesh and how the graphics look a little blocky. Turjah 2 for Pocket PC shows how much difference 16-bit color and a higher screen resolution make. Which game you would rather play? Throw in the Pocket PC's 16-bit stereo sound capability and the platform has the multimedia power to match if not surpass games on the Gameboy Advance. The Palm platform, on the other hand, still uses a cheap �piezo buzzer� device used in low-end electronics. Sound is essential in gaming. With the Pocket PC�s better audio capabilities, music sounds richer, sounds are more realistic, and you can even have speech synthesis, a staple element of gaming on desktop systems. The Palm�s simpler design was made primarily for keeping track of contacts and appointments. All the program icons on a Palm are grouped on the first screen rather than in different folders like a Pocket PC. The Palm's simplicity translates into a major (but not overwhelming) advantage over the Pocket PC as a gaming device because this simplicity makes the Palm easier to develop for. Try visiting a shareware Web site that contains both Palm and Pocket PC shareware, and you�ll find far more games for Palm. Most games developed for the Palm OS are done by individual authors rather than incorporated game companies. Furthermore, there are considerably more Palm freeware games available on the Internet than there are Pocket PC freeware games. Generally speaking, this grass roots development environment gives Palm developers more of a community relationship with gamers. However, since the Pocket PC is designed to be a multimedia device, it has one feature which aids greatly in game play and is lacking on the Palm: a directional pad. Palm devices have only one set of up and down buttons flanked by two more buttons on each side (6 buttons total). While the layout is good for basic Palm applications, it often makes gaming difficult. For less action-intensive games, the control system manages to work fairly well, but gamers often struggle while trying to play arcade-style games. Add-on gamepads such as the GameFace (which clamp on to the top of the Handspring) help, but there's no substitute for an on-board game pad, and the directional pad on most Pocket PCs gives them GameBoy- like simplicity out of the box. The performance discrepancy between the two platforms really sticks out in games of the same genre. 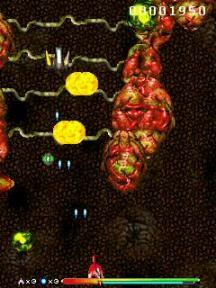 Take the top space shooter on the Palm OS, Zap!2000, against the Pocket PC's top space shooter, Turjah II. Turjah easily thumps the Palm OS's top game in terms of sound, graphics, and total multimedia experience. On the other hand, the Palm has more quality games in each major genre like role playing games (RPGs) (Kyle's Quest and Aldon's Crossing), simulations (Solar Wars and Dope Wars), arcade-style action (Zap!2000 and Agent Z), and racing (Race Fever and Car). The Pocket PC currently has relatively few good RPGs and racing games. More developers are being lured by the capabilities of the Pocket PC, however, and as Palm�s software advantage wanes, look for the Pocket PC to take a commanding lead. Palm may be the best place to start playing right now because of the plethora of games available, but the Pocket PC has far superior long-run potential due to its overwhelming performance advantages. The dramatic difference in performance between the two PDAs stems from the fact that the Palm was designed primarily to be a simple organizer, while the Pocket PC was created with the intention of being a multimedia monster. While Palm has an enormous amount of catching up to do with its more aggressive rival, look for the Pocket PC to draw more support from established game developers like Electronic Arts and Sega. The Pocket PC not only holds its own with sharp graphics and intense sound capabilities but also offers mobility, large storage capacity, and PC-like features that the Palm and even the GameBoy Advance don�t offer. With its raw power and game-friendly attributes, look for the Pocket PC to become a major player in the handheld gaming area. Chris is a freelance writer who currently runs Wireless Gamer, a site devoted to connected, mobile gaming.